Roy Fisher. Pphotograph by Ornella Trevisan. In what is turning out to be a sad week for poetry Rochford Street Review was saddened to hear of the death of Bristish Poet Roy Fisher. Fisher was raised in Birmingham, England, and educated at Birmingham University. His numerous collections of poetry include City (1961), A Furnace (1986), which was a Poetry Book Society Recommendation, The Dow Low Drop: New and Selected Poems (1996), and The Long and Short of It: Poems 1955–2005 (2005). The first American edition of his work was his Selected Poems (2011). His work is included in the New Penguin Book of English Verse (2000) and the Anthology of Twentieth-Century British and Irish Poetry (2001). Fisher had been housebound for several years, preferring to remain in his much loved house in the Derbyshire Peak District than to be looked after in a care home. 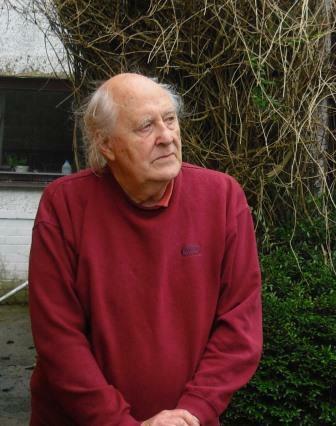 Playing the language, pleasuring the imagination and teasing the senses, Fisher’s witty, inventive and anarchic poetry gave lasting delight to his many dedicated readers for over half a century. This entry was posted in Issue 21, Roy Fisher and tagged British Poetry, poetry by Mark Roberts. Bookmark the permalink.